Next in the series on JV Jerky is this Hawaiian Style. See my previous reviews of their Mild, Habanero, Teriyaki, and Hot Cajun styles. This Hawaiian Style is described by JV Jerky as "Our Hawaiian Beef Strips are marinated with a natural unsweetened pineapple juice and brown sugar then gently smoked. The result is a taste like old-fashioned baked ham." Beef, pineapple juice, brown sugar, salt, sodium nitrite, garlic powder. The first thing I taste from the surface of these pieces is a fatty, oily flavor, soon followed by a light sweetness, and a faint smoky flavor. The chewing flavor starts with a lot of natural meat flavors, with a light sweetness, and just faint touches of pineapple flavor. There's a noticeable saltiness as well. For being labeled as "Hawaiian Style", this seems to hold up to that name. I do get a sense of eating something I'd expect to find at a local eatery on the Hawaiian islands. If you've ever been there, you'll know that locals like to eat foods with a lot of fat and sweet mixed together. And this jerky indeed has a lot of fat. The fatty flavor is what I pick up right away in every piece, and mixed with it is an oiliness that coats my mouth. But it also has a fair amount sweetness, but not a heavy one. It's probably light to medium in intensity, still less sweet than most teriyaki beef jerky. The pineapple juice flavor is very faint. You won't taste much pineapple if snacking away, it's only noticeable if you're analyzing the flavors carefully. Otherwise, the flavor that seems to stand out the most is the natural meat flavors and the saltiness. JV Jerky says this Hawaiian Style has a flavor like "old fashioned baked ham", but I don't really see it that way. But I agree that this doesn't really taste like beef. If I didn't know what animal it came from, I might believe it was roast pork, just based on what I know about Hawaiian cuisine. 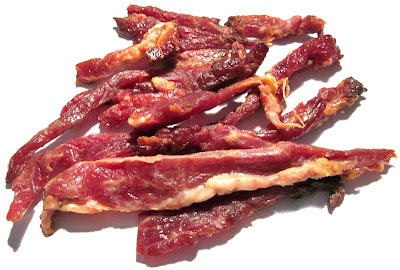 I do pick up a light smokiness, comparable to JV Jerky's Teriyaki, but not quite as much. The saltiness in this feels like it's at a medium level. Overall, what you're going to notice in this is an initially burst of fatty, oily flavor coating your mouth, with a good deal of natural meat flavors, and a medium level of saltiness. You'll pick up a light sweetness with a faint bit of pineapple flavor, and lightly noticeable smokiness. This is a semi-moist jerky with a very oily surface. Most pieces have a lot of flexibility, being able to bend all the way back themselves without cracking. Others seem to crack before then. Biting chunks off of these strips can require some gnawing and tearing due to the copious amounts of fat, and chewing seems fairly easy. The chewing texture starts out feeling pliable and chewy, with some initial chewing resistance but not much. It breaks down soon enough and chews to a soft mass quite with an average amount of chewing and work. By that point feels just like real meat, very comparable to Hawaiian style roast pork strips. Most of these pieces have large streaks and chunks of fat on them. Every piece has at least some fat on it. Some of the fat is rubbery and chewy, while others have that paste-like consistency of lard. I don't find any gristle or tendon, and only a minor amount of stringiness. I'm not getting much unchewable wads of tissue. 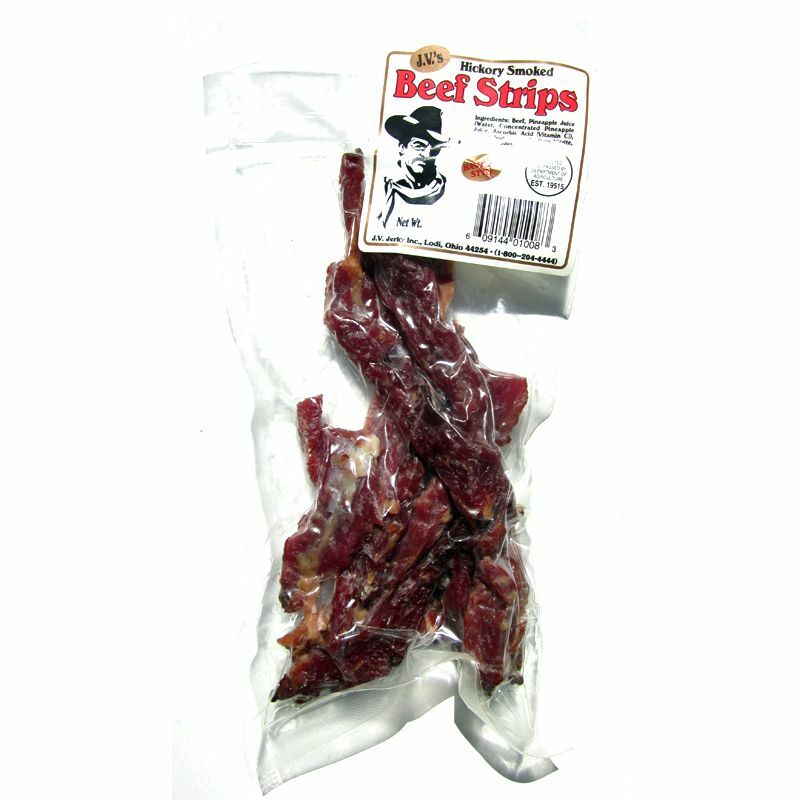 JV Jerky sells this Hawaiian Style from its website at a price of $7.75 for an 8oz package. If you bought four packages, the shipping costs to Southern California works out to $14.16, for a total of $1.42 per ounce. For general jerky snacking purposes, at the $1.42 price per ounce, it's a fair value. I'm getting a low level of snackability for an overall average flavor, average chewing ease, good chewing texture, but very fatty and oily. That price is considerably lower than what you'll spend at the grocery store for major brands of jerky, but offering a similar to slightly lower snack value overall. As a Hawaiian Style, at the same $1.42 price per ounce, it's an excellent value. I get the same Hawaiian flavor, experience, and greasiness as getting an order of roast pork strips from a Hawaiian eatery on the islands. This Hawaiian Style from JV Jerky seems to do a good job of representing that Hawaiian flavor and experience. It reminds me exactly of roast pork strips, the same taste and consistency, that I've gotten from local eateries in Hawaii, and from Hawaiian style lunch-shops here in the mainland. It even has all the liberal amounts of fat that you get from those places. But as beef jerky, and as a meat snack, I didn't enjoy having all that fat. There's a lot of oily flavor in this and I felt that paste-like lard coating the roof of my mouth and my tongue. I could have entertained the idea of awarding this a three-star rating had the flavor been more interesting. But as it stands, it's a simple flavor of natural meat and saltiness. Yes, there is a light sweetness, and faint notes of pineapple, and a bit of smokiness, but those additional flavors were too light to overcome the fat and oil. 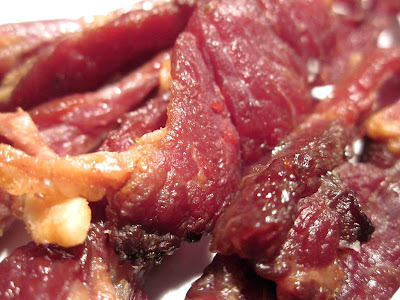 As for smokiness, JV Jerky seems to do better with their sweetened jerky like this Hawaiian, and their Teriyaki. Perhaps the sugary coating does a better job of trapping the real wood smoke flavor. My recommended beer pairing for this, go with a simple IPA. The lighter malt and intense hops should cut through the oiliness and help bring out more flavor. Go with the Stone IPA or the Sierra Nevada Torpedo.